When I was young my friends would always have sleep-over parties for their birthdays. We would stay up late, watch scary movies, eat lots of cake with sugary icing and buttercream flowers from the Cupcake Cafe, and play truth or dare. Then we would all change into our pajamas and sleep in sleeping bags in the living room. Whenever I see a cute pair of pajamas in a boutique or catalog it reminds me of my sleep-over party days and how much fun I used to have, except of course for the one time the we watched The Shining and I was terrified for weeks and had to sleep with the lights on. 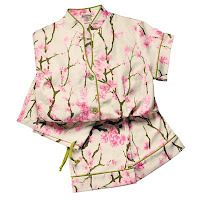 These Pink Blossom Pajamas from Bedhead, with a cheerful and springy cherry blossom pattern are flattering as well as comfortable. The mandarin collar and feminine cut makes them extra chic for lounging around the house. 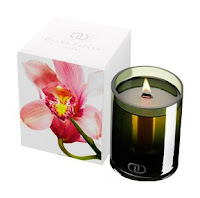 Forget about your spring cleaning and instead put on your cute pjs, light a Dayna Decker Yasmin candle, settle down with an iced Elderflower Sidecar, and have your own pajama party.